In today’s post, you’ll learn how web experts craft a call to action and use it to get online results. 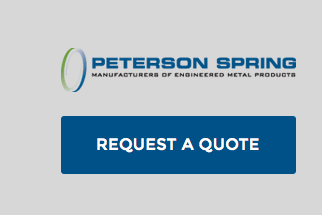 The Call to Action that helped increase Peterson Spring’s quote inquiries by 16 times. Beware—we’re jumping into a website topic that I’m super passionate about. This one web design concept has had a huge impact on our clients’ success. It’s one of the ways we increased quote requests for one client by 16 times. It’s also the one thing that amateur and DIY websites get wrong almost every time. A call to action (sometimes abbreviated CTA) is a word, phrase, button, or image that asks a website visitor to take a specific action. It is simply a website element asking your visitors to do something. Suggesting that visitors do something specific is where many business owners miss the boat. They assume that after a website visitor reads their About page and their list of services, the visitor will figure out what to do next. Your website visitors need to have the next step in your sales process laid out for them. People are busy, and they are distracted. Make their lives easy by handing them their next step on a silver (or brightly colored) platter. And now, see them in action. Here are a few CTAs we’ve crafted for our website design clients. Now, how do you write your own call to action? First, think about your target customer. Then consider the best first step to get that visitor to buy from you. In other words— They’ve visited your site and learned about you. NOW, what should they do? It may be helpful to consider your sales process. What is the most effective first step for you to turn a prospect into a sale? Some of our customers tell us that they convert the most leads to sales through a phone conversation. So we create a clear call to action on their website to “Give Us a Call Today” and include the phone number. What about you? Maybe you are a consultant who needs to build trust before you get hired. How about “Download My Free E-Book”? The most important thing is to consider your target customer and what may be too big of a leap after reading just a couple pages on your website. Focus on giving your website visitor a logical, comfortable next step. But won’t a call to action make me look pushy? This is a fear that many small business owners have. You don’t want to look like a pushy salesperson on your website. Instead of thinking of a CTA as a push, think of it as a helpful suggestion. You aren’t hard-selling with a call to action, you are simply guiding the visitor toward a positive outcome with you. Consider this: websites without a call to action often frustrate visitors. Visitors get lost and can’t figure out the best way to contact you or what to do next. A CTA provides helpful clarity. When they’re ready to take the next step, they’ll be comfortable knowing exactly how to do it. And as a side note, I always recommend honesty in a call to action. Never promise something you won’t deliver just to get that inquiry, phone call, or email address. This will make sure your visitor feels satisfied rather than frustrated with a bait and switch. Make your CTA stand out! Use a bold, contrasting color or larger font in your design. You don’t want your CTA to be missed. Create urgency. Consider using the words “now” or “today,” as in “Request a quote today!” Make your visitor realize that now is the best time to take action. Make it clear where to click. If you want visitors to click a link (to go to your Contact or Request a Quote page, for example), make it clear where the link is. Make the link a bright color or make it a button. Ready for your website to start sending you leads? 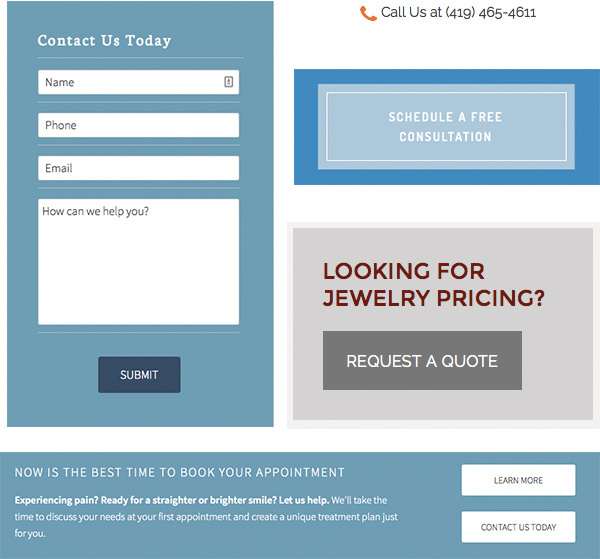 Create a call to action now, and include it in your sidebar, website footer, home page, or directly in your page text.